Continuing with the Australian theme. We have 1/2 a dozen Red Malee Burl d20s. 2 of them with some super nice sapwood. Hi there, few questions – are these still available? Do you they come sans-engravings as pictured? Could I get a price per item/for the set? please send your request to contact@artisandice.com so we have your email address to reply to. 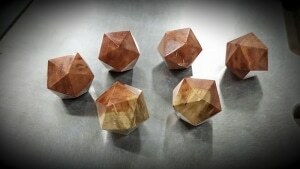 these dice have already been engraved but we do have 5 of them left. I am in the process of making a French game board to be used as an educational tool in the classroom. The concept has already been developed, but I am in the process of having the game board itself designed. My idea is to have the game board image printed onto thick paper, then laminated several times to a wood board. I would need 2 dice (one 6-sided and one 8-sided) for it as well as 4 to 6 game pieces. The 6-sided dice would need to be numbered and the 8-sided dice would need to be lettered with the words “Je”, “Tu”, “Il”, “Elle”, “Nous”, “Vous”, “Ils”, and “Elles” in the same font as the game cards and game board. I am not sure if engraving or etching is better as I don’t want the engraving to create a weight imbalance where the dice would have a tendency to fall on one particular side when rolled. It was mentioned to me that rounded dice might be better as they would be less likely to mark up the laminated game board. It was also mentioned to me that Baltic wood might be a good choice as it is less grainy and is a hard wood. Do you think this might be something you would be interested in helping me with? I would appreciate your advice as to the most durable and nicest looking wood to use and any other thoughts you might have. It has proven to be a challenge to find someone who can make custom wood dice that also look beautiful. I appreciate your time and look forward to hearing from you! We’ve learn many outstanding products the following. Undoubtedly importance book-marking regarding revisiting. My partner and i amaze how the good deal try out you determine to produce such magnificent helpful web site.